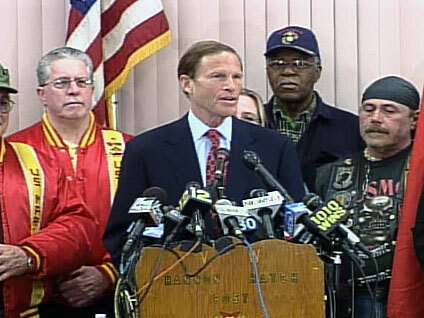 Connecticut Attorney General Richard Blumenthal appeared with a group of veterans today to respond to a report that he had falsely claimed to have served in Vietnam. "On a few occasions I have misspoken about my service and I regret that, and I will take full responsibility," the Democratic Senate candidate told reporters. "But I will not allow anyone to take a few misplaced words and impugn my record of service to this country." He said his claims to have served in Vietnam were "absolutely unintentional - a few misplaced words." He cited as an example saying he served "in" the Vietnam War instead of "during" the war. As the New York Times first reported, Blumenthal, who got at least five deferments that kept him out of the war, has made reference to "the days that I served in Vietnam." In 2003, in comments about American troops serving oversees, he also discussed what he saw "when we returned." Blumenthal did serve six years in the Marine Corps Reserves in the United States, working on projects like a Toys for Tots Drive. He also served for six months at Parris Island in South Carolina, where many Marines go through basic training. Blumenthal was surrounded by veterans at today's event, and one introduced him as a strong supporter of veterans who is now facing "malicious, deceptive charges." The attorney general stressed that he got "no special treatment, no special privileges" to join the Marine Corps Reserves, stating that he simply found the Corps in the phone book and called up. He said "unlike many of my peers" he chose to serve his country, and complained that the original New York Times report "denigrates service in the Reserves." He said he could have chosen not to join the Corps via his deferments but wanted to serve the country. Blumenthal added the veterans gathered with him know that he attends many events every year on behalf of veterans and that they have heard him on multiple occasions "describe my pride in having served in the U.S. Marine Corps reserves during the Vietnam era." Blumenthal has often spoken of his service "during" the war, leaving it unclear whether he had served at home or abroad.